After 6 p.m. in Shinagawa station, Kounan exit is crowded with office workers who go to Izakayas(Japanese style bar restaurant) after their work. 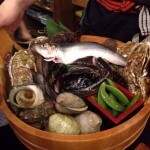 Among those Izakayas, Haraguroya might be the most popular restaurant around here. After 6 p.m. in Shinagawa station, Kounan exit is crowded with office workers who go to Izakayas(Japanese style bar restaurant) after their work. 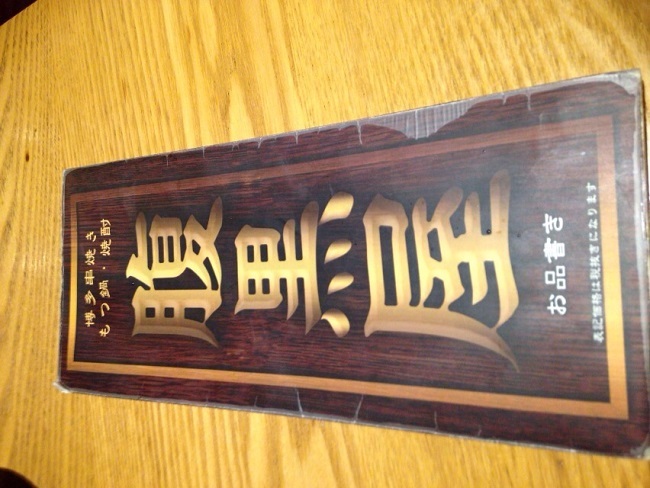 Among those Izakayas, Haraguroya might be the most popular restaurant around here. Name does not give a good impression, but interesting. I asked staff the meaning of the name. Indeed, Motsunabe (hot pot stew made with offal) and Sumibi Yakitori (charcoal roast chicken) are really good. Getting up stairs, I went to the second floor. 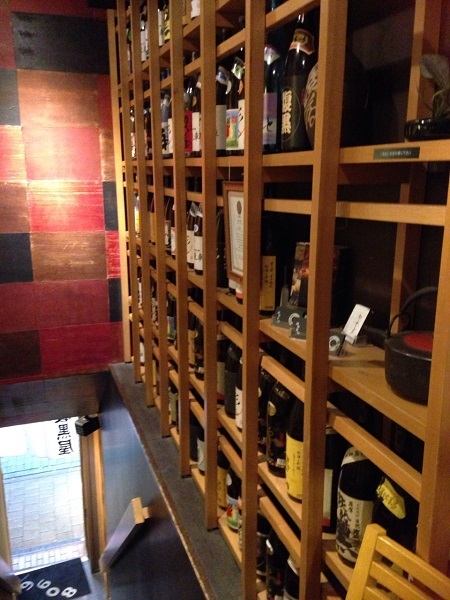 As I go up, I saw Shocyu(alcohol) bottles are lined up by the wall. 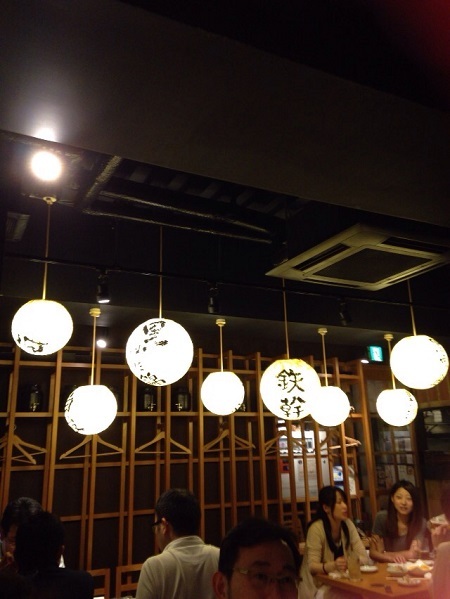 When I arrived at 19:30, restaurant was already full of people. 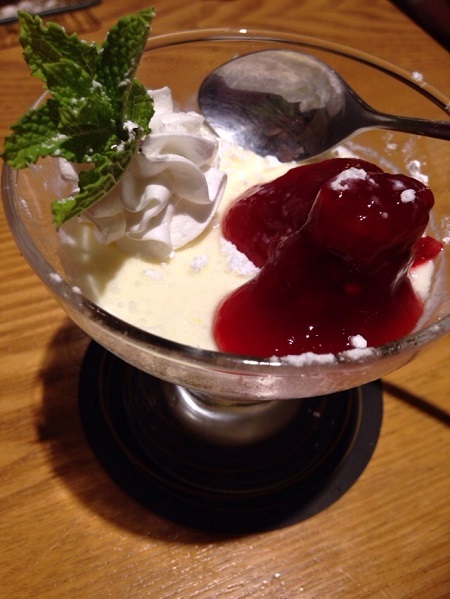 I recommend you to make a reservation. 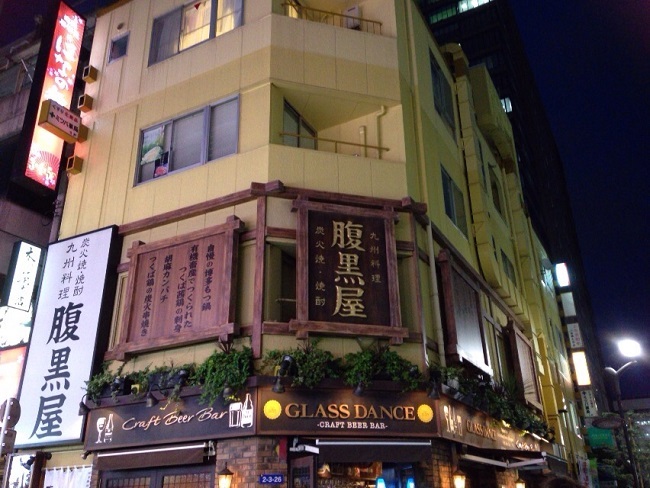 Restaurant is casual atmosphere and lively with people who enjoy their foods together with nice conversations. I ordered drink first and as I wait for it, I think about menu. 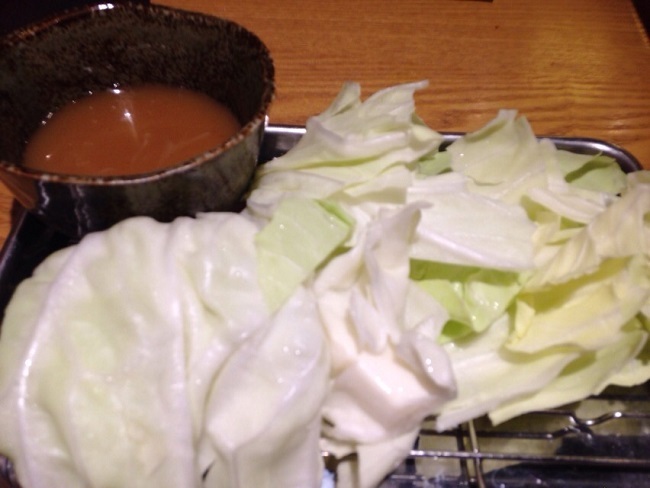 I put miso(soy bean paste) on cabbage and eat. 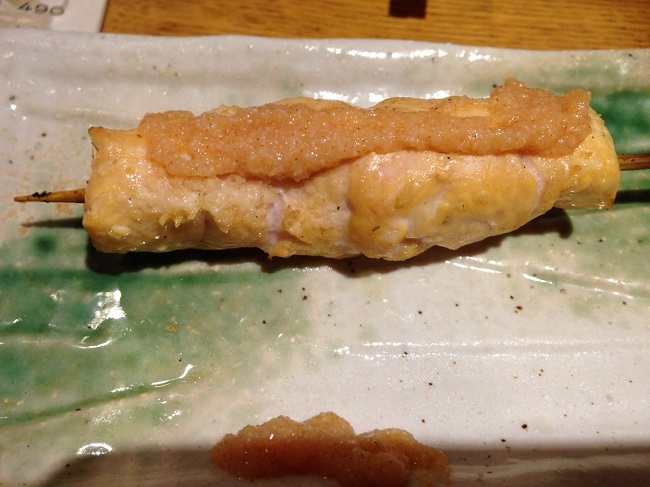 First, I ordered sesame Kanpachi(greater amberjack). 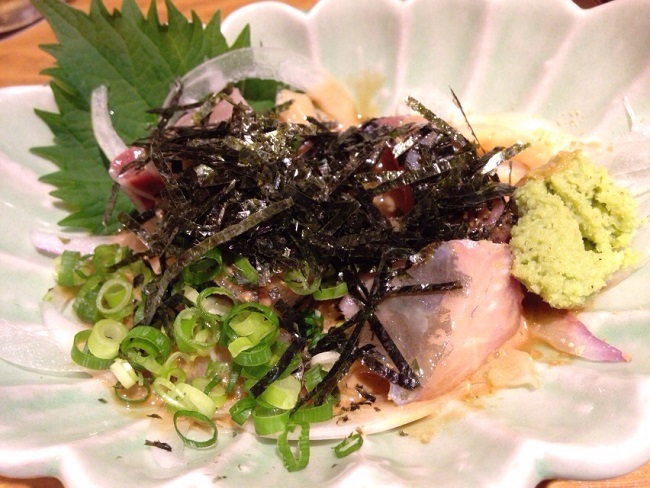 Combination of sashimi of Kanpachi and sesame sauce is very good. Taste perfect with sweet potato shochu. 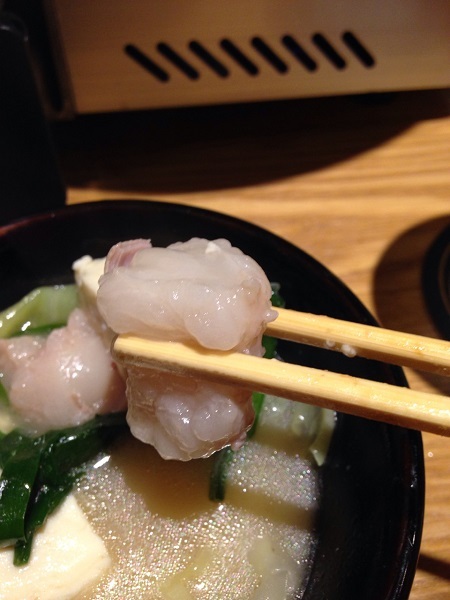 White meat with Mentai(cods) is resilient and fresh. Subsequently, liver, body, Furisode(arm of chicken) arrived. Meats are juicy, temper and seasoning is perfect! 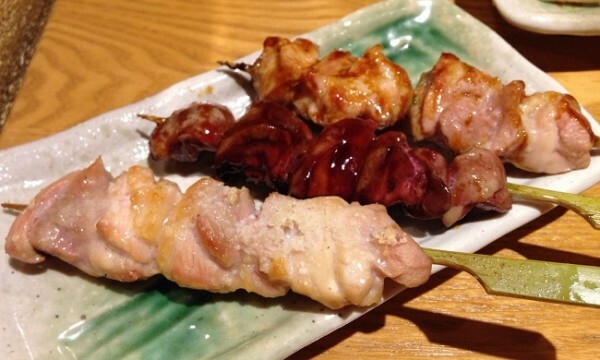 If you want to taste chicken itself, you can ask staff to make white meat and liver rare. Mashed shrimp are put between breads and fried. 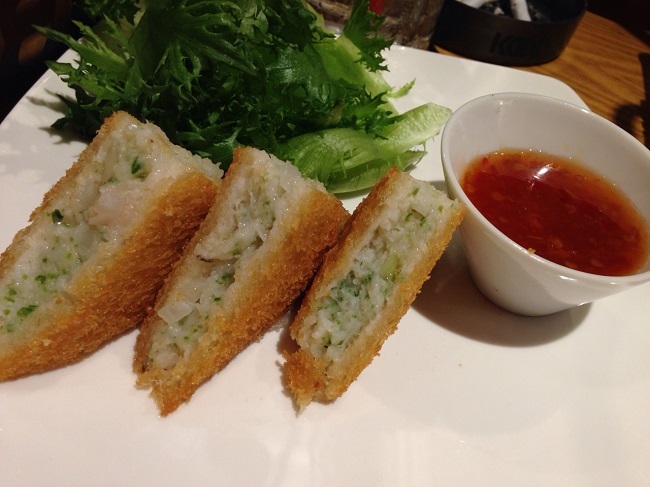 Shrimp toast is very crispy! I’m sure women love it! 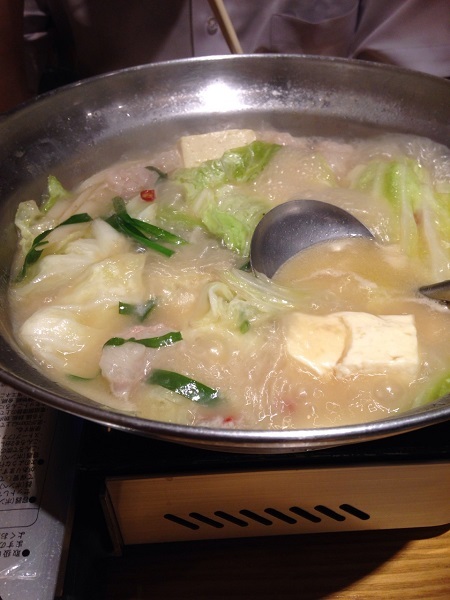 Main dish, Motsunabe(hot pot stew made with offal)!!! 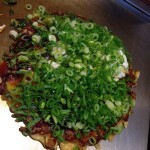 You can choose flavor from three kinds; salt, soy sauce, miso. I recommend you the simplest one, salt. As put soup on cabbage, boil until it gets soft. When cabbage gets soft and giblets get bigger, it is the best timing to eat! Giblets bounce in my mouth! It contains plenty of collagen. Soup is good as well because the taste of giblets and cabbage are seeped out. Sake goes very good with it. It keeps your body worm in a cold day, If you boiled too much and soup gets salty, you can ask staff too add soup. 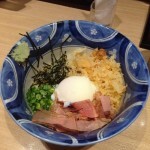 It is also delicious to put rice or noodles. Because it was so good, I finished it in a second! Panna cotta I ate the last was creamy and delicious as well! 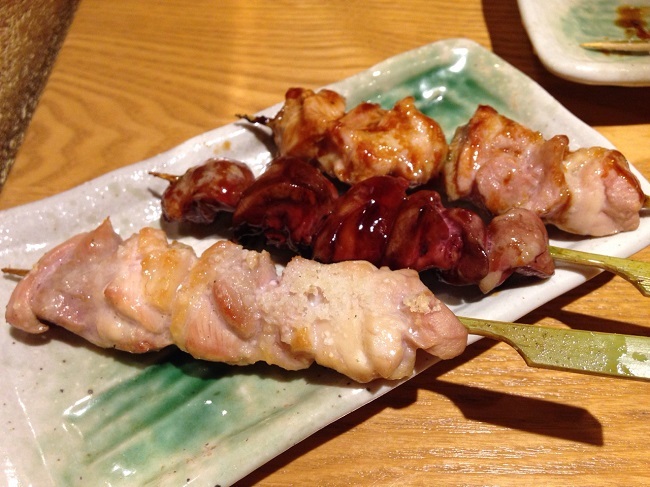 “Toriteru” is a yakitori (grilled chicken on a skewer) bar in Shinagawa, which is standing in obscurity, which makes it hidden from outside world. Exit Shinagawa Station Takanawa Exit and walk towards Kawasaki for 3 minutes. 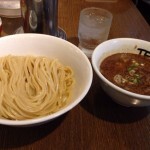 There is a ramen street.Among them, Tsukemen Tetsu has been receiving attentions.